You probably spend a considerable amount of time and money each year to market your HVAC business to attract new customers. Yet, according to a survey published by Round Peg Biz, an HVAC consulting firm, the average HVAC dealer loses 10% to 20% of its customer base every year. This statistic means that while you are working hard to build your customer base with new customers, many of your current customers are leaving you to do business with a competitor. And for the most part, you won’t even know when a customer leaves. Generally, customers don’t call you to tell you they are mad, disappointed or frustrated with you or one of your people. They just fold up their tents and silently steal away. But, the damage does not end there—they quite often tell others about their dissatisfaction with your company. So why do so many customers leave? The same study found that while some customers leave for reasons beyond your control, the vast majority, 67%, leave due to the indifference, or perceived indifference defined as a lack of appreciation of the company for them. When you lose a customer, what are you losing? 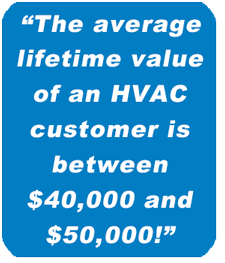 Consider this figure: the average lifetime value of an HVAC customer is between $40,000 and $50,000! It is essential that you begin to reverse the trend in your company—to stop the loss of customers and to capture the value of lifetime customers. Increasing Customer Satisfaction is the first course in a four-part series titled Creating Lifetime Customers presented by Bob Gee and currently available on My Learning Center. These courses explain the impact of poor customer retention rates and outline proven strategies for retaining customers for life. Bob Gee spent over 25 years with a multi-state wholesale distributor, serving as Director of Dealer Development and Field Sales Manager. He then formed Robert Gee & Associates and developed a variety of HVAC dealer training programs on sales, management, marketing and customer service. He has facilitated over 2,000 workshops and presented over 100 keynote addresses. How Do I Access My Learning Center? My Learning Center is easy to access and use. In a matter of minutes, you can be online participating in a training session. My Learning Center is an easy way to learn more about the latest Tempstar products, programs, sales, customer service and marketing tips on your home or office computer, at a time that's convenient for you.